Learn how to do for your own firm what you do for your clients: define a differentiating positioning. Ranked by Amazon as one of the top ten books on brand building, with 5-star rating customer reviews. “When it comes to knowing how to create an environment in which people can do their best work, Tim Williams knows the right principles. He can show marketing professionals how to get golden eggs without killing the goose." Stephen R. Covey, Author of "The 7 Habits of Highly Effective People"
Making the decision to adopt a differentiating business strategy is difficult for professional service firms. Most firms, particularly those concerned with revenue growth, desperately want to be all things to all people. But by appealing to everyone, they appeal to no one. They forget that standing for everything is just another way of standing for nothing. To fully deliver on our brand, what is lacking from our mix of capabilities and services? Do we have the kind of people we need to execute on our positioning? Given our focus, what kind of criteria should we apply when recruiting new employees? How should our new business approach change? What specific criteria should we apply to prospective clients? How could our systems be improved to support our internal brand? Do we need to change our compensation structure to better reflect our positioning? Are we sending the right message about our brand when others make contact with us? Remember that your goal isn’t to show how you’re just like other leading firms. It’s to show how you are different. What’s true in positioning is true in new business and self-promotion. Effectiveness requires sacrifice. You can’t be good at everything and you can’t go after everybody. Seek relationships only with clients who want what you can deliver. Don’t fake through your weaknesses; capitalize on your strengths. Named by Amazon as one of the top ten books on brand building, this useful book, written especially for agency professionals, will help you make the decision to take a stand for your agency brand. 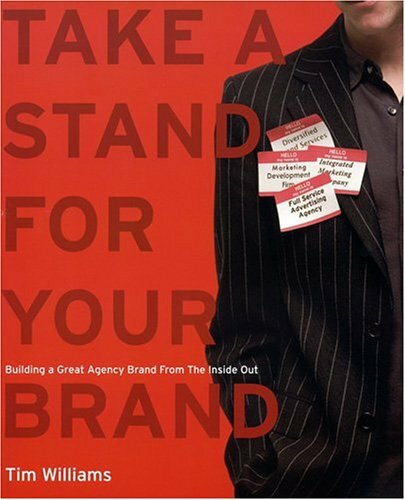 Named by Amazon as one of the top ten books on brand building, this useful book, written especially for agency professionals, will help you make the decision to take a stand for your agency brand.